With Christmas just around the corner, I’ve found I still don’t have the perfect morning-of breakfast. I have a secret wish to have that one amazing sweet bread my kids will make in their homes one day, for their own children on holiday mornings. After playing around with sugared cranberries and cream cheese frosting, I’ve decided they might be the keys to what I am searching for. 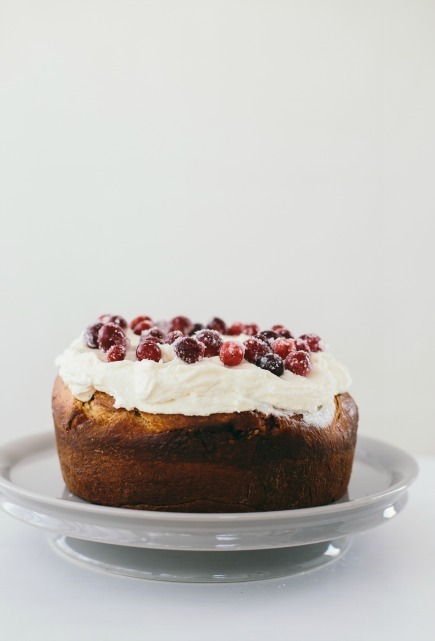 The tart cranberries and tangy cheese pair well together, especially when perched on a sugar-swirled brioche cake. We all oohed and aahed on first bite.